Proactive Advisor Magazine: Michael, what was your path to becoming a financial advisor? I grew up in a small town in Pennsylvania and had supportive and loving parents and siblings. I was very motivated throughout my school years. I worked to earn extra money, was involved with our church, had a strong focus on academics, played football, and was captain of the wrestling and track teams. I was class president for three years, was a member of several clubs, and won a significant leadership award my junior year. I also was one of the co-founders of our school’s chapter of the Fellowship of Christian Athletes. I had an uncle who was a West Point graduate, and that influenced my decision to try to gain admission to the United States Military Academy at West Point. It was an arduous process, but the rewards were tremendous. The academy offers excellent academics, training in leadership skills, and an unmatched commitment to service and teamwork. I earned a Bachelor of Science degree in general management at West Point, with a field of study in systems engineering. I was commissioned a second lieutenant in 1996 and attended military police officer training. My first assignment was as a military police platoon leader in Germany. We deployed our platoon for six months to Bosnia and Herzegovina for NATO peacekeeping operations. When we returned to Germany, I worked as a battalion personnel officer and a group intelligence officer. When I left the military in 2001, I decided I wanted to stay in Germany. I found an opportunity with a financial-services firm that helped U.S. military personnel and civilians who worked with the military to address their personal financial goals. We provided guidance on military benefits programs, insurance coverages, and investments. We were especially focused on how individuals could start planning for their financial lives after their military service. After a few years, I joined another U.S.-based firm in Germany, and that allowed me to develop my own book of business and establish long-term relationships with clients. I stayed with that firm for 11 years, including when I moved my practice back to the U.S. to the Tampa area in 2011. Shortly after, I rededicated my life to the Christian faith, which has been a huge blessing. I have since trained for and earned a pastoral certificate and am a member of the National Association of Christian Financial Consultants. I started working with a new broker-dealer in 2017, G.A. Repple and Company. They have a commitment to helping advisors and their clients align faith, family, and financial planning. This fits perfectly with my personal mission in working with clients. Talk about how you see your role as a financial advisor. Our firm is dedicated to helping our clients achieve the financial future they deserve. The services we provide to our clients allow us to build and maintain long-lasting relationships both personally and professionally. We believe in a systematic approach to financial planning, concentrating on wealth and risk management. Our firm specializes in working with Americans living abroad and current members of the military and veterans. We also work closely with churches and give presentations to their members about bringing the principles of their faith into their financial lives. I personally believe that financial planning should be a lifelong process. I am committed to working with our clients every step of the way as they encounter new life situations and new opportunities. Our firm is very much in sync with the principles put forward by G.A. Repple, which was founded in 1982. G.A. Repple is a full-service broker-dealer and supports our firm as we provide investment guidance and tax-advantaged strategies, asset management, planning for generational wealth distribution, retirement planning, and planning for charitable giving. I greatly appreciate having this resource and that they help provide careful due diligence on the products, services, and strategies that we can offer clients. They believe, as we do, that there can be a very strong and beneficial connection between faith, family, finances, personal freedom, and philanthropy. We want to work with clients in an empowering and holistic way, helping them achieve the things that are most important in their lives. What are some of the financial-planning or investment concerns your clients face? I work with each client or client couple on a highly individualized basis, coming to understand their unique needs and aspirations. Let me talk about three different types of clients to give a flavor of some specific financial concerns. First, let’s take the case of a young Army captain who knows that she will eventually enter civilian life and have a second career. That could be coming up soon or be several years away. Having spent her adult life solely in the military, she may have questions about how she should start planning for life after the military. What can she expect in terms of benefits that carry forward or the outlook for retirement savings? Does she plan on having a family or already have one—and kids who will one day go off to college? Should she be considering issues related to college planning, life insurance, disability and long-term care, and investments, both within and outside of her retirement plan? While there are a lot of unknowns in this case, having that sort of thought-provoking conversation can go a long way toward educating the client and starting to formulate ideas around financial planning right now. Another situation might be a couple who I meet through networking at my church or my presentations at other churches. They could be a relatively high-net-worth family or a family that still has not totally recovered from the effects of the last recession. In the former case, estate planning and developing a charitable giving plan might be their top priorities, along with growing and protecting their investment assets. The other couple may be more focused on developing sound budgeting practices, developing a plan for reducing their debt, finding ways to efficiently plan for their kids’ education, and planning for retirement income. It is quite likely in both cases that they would be interested in how their financial lives can better reflect their faith-based beliefs. I am prepared to address that and can introduce clients to biblically-based principles of stewardship as well as faith-based investment strategies. Finally, we do a lot of work with small-business owners, both on their individual financial-planning needs and their companies’ retirement plans. Most of these cases have been truly small businesses, many times a sole proprietor, and the owner is looking for cost-efficient ways to establish a retirement plan. We have provided guidance on SIMPLE IRAs and Solo 401(k)s. We also work with plan participants in the Florida retirement system. We can provide investment guidance within their plans through a self-directed brokerage window, using the services of third-party investment managers. I believe that helping these individuals use risk-managed strategies for a portion of their retirement accounts is a suitable way to mitigate risk and market volatility. I think in all of these cases, no matter what the client sees as their most pressing needs, they can best be served through a holistic planning process that considers their entire financial situation, their financial objectives, and their life aspirations. How do you talk about the benefits of actively managed strategies to clients? It goes back to client education. I feel I have been blessed with unwavering faith and the ability to be an effective teacher. I explain to clients the many tools and strategies that are available to them as we shape their overall financial and investment plans. One category includes the professional resources of third-party managers who employ actively managed investment strategies. We review the nature of the markets and mathematical concepts, such as the fact that it takes a much larger gain on a percentage basis to overcome a portfolio loss. Doesn’t it make sense to attempt to mitigate those losses in the first place? Through this type of educational process, I think clients come to see why active investment strategies that can adjust to changes in market conditions can play an appropriate role in the overall approach to their investment portfolio. Michael Mandarino is the founder of 123 Investing, located in Apollo Beach, Florida. 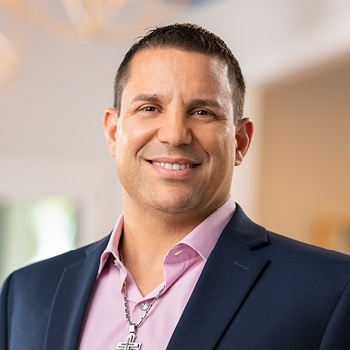 His firm provides “a systematic approach to financial planning, concentrating on wealth and risk management and retirement-income planning.” Mr. Mandarino works with individuals from all walks of life, small businesses, and churches and their members. He also works with active and retired members of the military in the U.S. and abroad. Mr. Mandarino grew up in a small town south of Pittsburgh. He was one of four children and says he grew up in a “loving, positive family atmosphere.” He was a football player and captain of his high school’s track and wrestling teams. He says he “worked part-time jobs all the time” while being focused on academics, school activities, and sports. He attended the United States Military Academy at West Point, receiving a Bachelor of Science degree in general management, with a field of study in systems engineering. He was commissioned a second lieutenant in 1996. Mr. Mandarino was trained as a military police officer and was primarily stationed in Germany. He held the positions of battalion personnel officer and group intelligence officer before leaving the service in 2001. Mr. Mandarino started his financial career guiding U.S. military and federal employees in Germany toward achieving their personal financial goals. In 2011, he relocated to the Tampa area as an independent financial advisor, offering comprehensive financial planning to clients. He is a member of the West Point Society Florida West Coast Alumni Chapter, Veterans of Foreign Wars, and the Association of the United States Army. He is also an officer of the local affiliate of Business Networking International. Mr. Mandarino’s wife works as the firm’s operations and marketing manager. He has a daughter who recently graduated from college. He enjoys working out, fishing, traveling, and spending time with friends and family. Mr. Mandarino is a member of the National Association of Christian Financial Consultants and has received a pastoral certificate from the Bible Training Centre for Pastors. He and his wife are active members of Crossing Church in Ruskin, Florida, and he has been a leader of the Iron Men Ministry at the Tampa campus. He also contributes his time to charitable organizations in the area. Disclosure: Securities and investment advisory services offered through G.A. Repple & Company, a registered broker-dealer and investment advisor, member FINRA & SIPC. 101 Normandy Road, Casselberry, FL 32707.